You have to hand it to developers Renegade Kid: they’re certainly trying their best. Like their Dementium and Moon before it, Dementium II is, at the very least, technically impressive. Getting those tiny DS screens to create a little atmosphere is no mean feat, and if you sit in the dark with a pair of headphones on Dementium II does a remarkable job of dulling your brain against the distractions of the outside world while keeping it engaged in what’s generally a decent first-person survival horror. 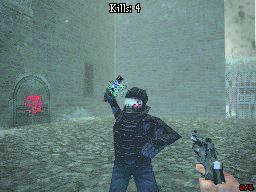 As in the original, much of the action here takes place in the dimly lit corridors of a decrepit mental asylum, home to a sinister doctor and a handful of enemy types – lumbering, open-chested zombies mostly, as well as tazer-wielding guards, bags of exploding pus and, of course, the obligatory ‘annoying ones’ (jumpy leggy-brains that make no attempt to disguise the fact they’re based on Half-Life 2’s poison head-crabs). The flashlight is back too, that little cone of brilliance that will help you nosey around the many corridors, seeking out scant ammo supplies and pinpointing enemies. Mercifully, you can now attack and use the flashlight simultaneously… just as long as you’re using a one-handed weapon. Likewise, navigation has also received a bit of an overhaul with a map that’s genuinely useful (as opposed to the constant irritation it was last time) and it will, the few times you’re at a loss as to where you need to go, steer you in the right direction. Perhaps Dementium II’s biggest improvement over the first game, however, is the wealth of environments it throws at you. Moon and Dementium had players suffering corridor fatigue after the first hour, and while the problem is still present in small doses here, Dementium II offers players some nice outdoor locations to help break the indoor monotony. All told, it’s accomplished stuff, but the problem still remains: is a ‘fairly decent’ FPS any better simply because it’s impressive for the host hardware? We’d argue not and, good though it is for DS, Dementium II is just ‘fairly decent’ when compared with other shooters. If you’re looking for an FPS on DS specifically then you’ll struggle to find better, but the rest of us are better off sticking to shooters on bigger screens. It’s accomplished stuff, but the problem still remains: is a ‘fairly decent’ FPS any better simply because it’s impressive for the host hardware? We’d argue not and, good though it is for DS, Dementium II is just ‘fairly decent’ when compared with other shooters. If you’re looking for an FPS on DS specifically then you’ll struggle to find better, but the rest of us are better off sticking to shooters on bigger screens.